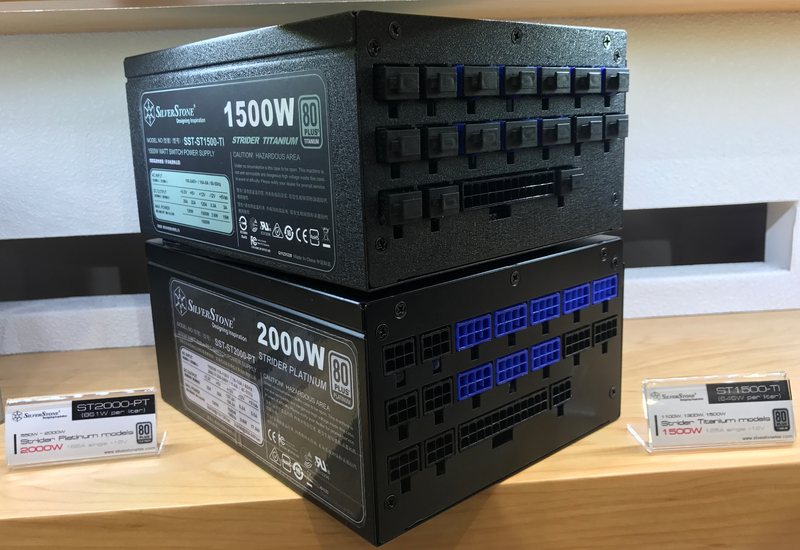 SilverStone demonstrated the industry’s first 2000 W ATX power supply that carries the 80Plus Platinum badge at Computex this year. The Strider Platinum 2000 W PSU is aimed at overclockers as well as cryptocurrency miners who care about efficient and quality power supply. The SilverStone SST-ST2000-PT PSU is compliant with the ATX12V v2.4 as well as EPS12V v2.92 standards and is rated for a 166.5 A maximum load and 1998 W power. The PSU carries the 80Plus Platinum logo and is therefore at least 92% at 50% load. 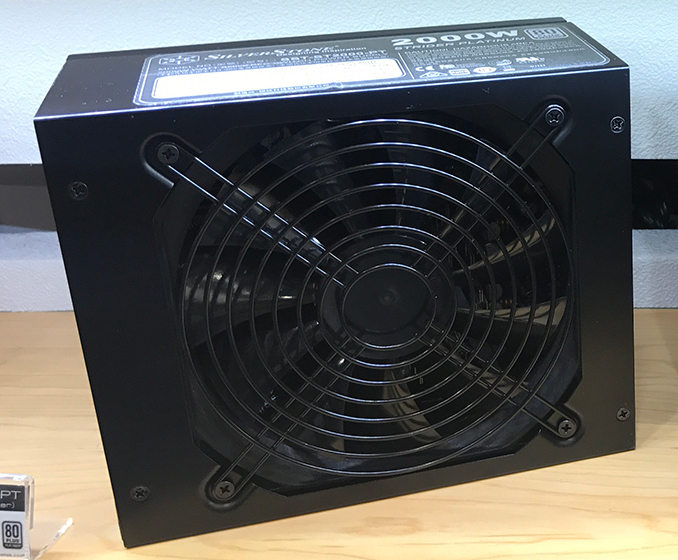 The power supply is the industry’s first 2 kW ATX/EPS PSU to receive any 80Plus badge (at least based on the current list), so the fact that it actually carries one of the higher-grade logos looks important too. Just like other high-wattage PSUs aimed at gaming and mining rigs, the SST-ST2000-PT features eight 8-pin PCIe power connectors to drive multiple graphics cards. Obviously, it will also feature multiple SATA power plugs and other cables for high-end systems. Externally, the Strider Platinum 2000 W from SilverStone looks similar to the company’s Strider Titanium 1500 W, so it is possible that the two PSUs rely on the same platform and have some similarities internally as well. 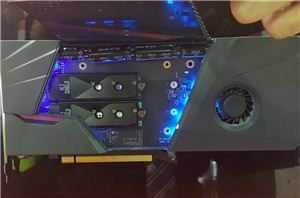 It is noteworthy that the SST-ST2000-PT unit demonstrated at Computex did not feature the SilverStone logo, which may indicate that the PSU is still in its final development stages. 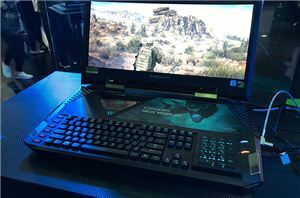 In the meantime, if SilverStone is demonstrating the product, it is highly likely that it will be available in the coming quarters. 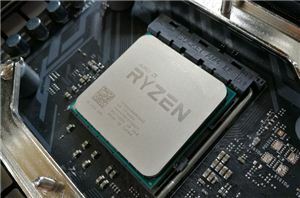 As for pricing, a 2 kW 80Plus Platinum PSU is not going to be cheap, but if you need to power an overclocked extreme workstation, then this one will be a good candidate. Personally, when I build a machine (for myself) I spec the PSU so that max load it'd be at 50%. Yeah, yeah... power inefficiency while idle and all that, I know that much. But such headroom makes for a silent system with lower PSU temperatures and possibly increased longevity.